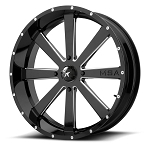 - Available in both machined with black and glossy black finishes. - 1000 lb. 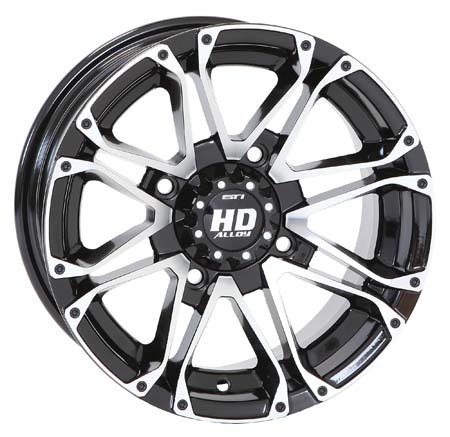 load rating for both 12 inch and 14 inch rims. Great wheels and the fastest shipping I've ever had , ordered wheels on a Wednesday morning received wheels at 3:00pm very next day ! This wheel was nice looking and appeared to be well built but was not a 6+1 offset as marketed. The backspacing as measured from the back of the hub plate to the outer edge of the rim was less than 5 1/4" which was no better than my existing wheels. I wanted to return to a 50" width (currently at 52") so it didn't appear these STI wheels would accomplish this although I did not mount a tire so an actual trial was not completed. I returned the wheels for credit even though the STI staff assured me the wheels would work on a 50" machine. I received excellent service from Pure Offroad but my concern was outside their control. Great product, fits perfect, as expected. Wheels came as expected and look very good. Seem well built and couldn't as for better service from a start to finsh! 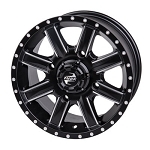 Rims are described just as it is on the website. Very fast shipping. Got them in within 24 hrs. Bought a set of the 6+1 offset for a friends 570 RZR. Couple small mods on the front sway bar and good to go. Keeps the machine at 50"s. makes the RZR look sweet too. As other reviewer stated you can't use a impact socket on the lugs, the narrower standard sockets do fit in the lug holes. same with the HD4's. As always great service from Pure Off Road and fast shipping. 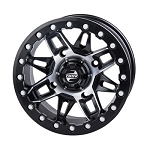 Q: does this wheel come with center cap? Q: I have a 2012 Polaris RZR 900 XP. I have 32" Silverbacks with 14 " ITP SS rims. Will these rims fit on my machine? i am hopeing to bring my width down to 62" to fit through bridge at trail mouth. Existing setup is too wide. Stock wheels are a very tight fit as well. Do you ship to Saskatchewan, Canada? 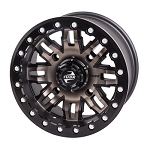 A: Yes these rims fit your machine, yes we can ship these to Canada, we'll need you to contact us with your full shipping address so we can price it out for you. Q: do wheels ship with lug nuts?